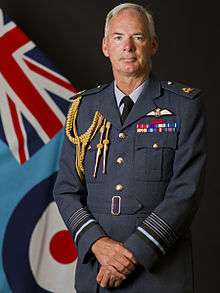 Air Chief Marshal Sir Andrew Douglas Pulford, GCB, CBE, ADC (born 22 March 1958) is a retired senior Royal Air Force (RAF) commander. A helicopter pilot with operational service in Northern Ireland, the Falklands War and Iraq War, Pulford commanded RAF Odiham and No. 2 Group, and served as Assistant Chief of Defence Staff Operations, before taking up the post of Deputy Commander-in-Chief Personnel at Air Command and Air Member for Personnel in 2010. He became Chief of the Air Staff (CAS) on 31 July 2013, retiring from the Royal Air Force on 12 July 2016. Born the son of Douglas and Jean Pulford, Pulford was educated at Magnus Grammar School in Newark. Pulford joined the Royal Air Force as an acting pilot officer in January 1977, joining No. 72 Squadron, before spending many of his 5,000 flying hours piloting Chinooks with No. 18 Squadron from RAF Odiham. He was regraded to pilot officer in January 1978, and then promoted to flying officer in January 1979, and flight lieutenant in July 1981; seeing service in the Falklands War with C Flight on board RFA Tidespring, while on exchange service with the Royal Navy in 1982. He had an exchange tour with the Royal Australian Air Force between 1985 and 1987. Promoted squadron leader in January 1987, and to wing commander in January 1994, he became Officer Commanding No. 18 Squadron in 1996, and Principal Staff Officer to the Chief of the Air Staff in 1999. 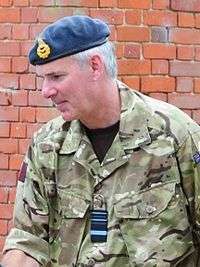 Promoted to group captain in January 2000, he took the Higher Command and Staff Course at Defence Academy of the United Kingdom, Shrivenham, in 2001, before becoming Station Commander at RAF Odiham in December 2001 and being deployed as Commander Joint Helicopter Force Headquarters for Operation Telic in Iraq. Appointed a Commander of the Order of the British Empire in the Queens Birthday Honours 2004, he was made Director Air Resources and Plans at the Ministry of Defence in August 2004 and, after being promoted to air commodore in January 2005, he became Air Officer Commanding No. 2 Group with the rank of air vice marshal in February 2007. Pulford then served as Assistant Chief of the Defence Staff (Operations) from September 2008, until his appointment as Deputy Commander-in-Chief (Personnel) at Air Command and Air Member for Personnel, based at RAF High Wycombe, with the rank of air marshal in September 2010. Pulford was appointed Knight Commander of the Order of the Bath in the 2013 New Year Honours. He was also promoted to air chief marshal on taking up the appointment of Chief of the Air Staff (CAS) in July 2013, the first helicopter pilot ever to be professional head of the Royal Air Force. As of 2015, Pulford was paid a salary of between £175,000 and £179,999 by the department, making him one of the 328 most highly paid people in the British public sector at that time. He was appointed Knight Grand Cross of the Order of the Bath (GCB) in the 2016 New Year Honours. Pulford received his GCB at a joint investiture ceremony at Windsor Castle along with former First Sea Lord Admiral Sir George Zambellas on 13 April 2016. Pulford's interests include military history, motorcycling, old cars and sailing. In 1982, Pulford married Nicola Jane Pearse; they have a son and a daughter. ↑ The London Gazette: (Supplement) no. 47154. p. 2473. 21 February 1977. Retrieved 18 Jun 2011. 1 2 3 4 5 6 7 8 Mike Drewett, ed. (31 July 2013). "Helicopter Pilot becomes CAS". Royal Air Force. www.RAF.mod.uk. Retrieved 28 July 2016. ↑ Air Force Leadership: Whole Force Reality. RAF Leadership Centre. 2015. ISBN 978-0-9928097-2-0. ↑ "Air Member for Personnel & Deputy Commander-in-Chief Personnel". Royal Air Force. www.RAF.mod.uk. Retrieved 27 January 2013. ↑ The London Gazette: (Supplement) no. 47451. p. 1267. 30 January 1978. Retrieved 18 Jun 2011. ↑ The London Gazette: (Supplement) no. 47763. p. 1637. 5 February 1979. Retrieved 18 Jun 2011. ↑ The London Gazette: (Supplement) no. 48702. p. 10372. 11 August 1981. Retrieved 18 Jun 2011. ↑ The London Gazette: (Supplement) no. 50793. p. 72. 5 January 1987. Retrieved 18 Jun 2011. ↑ The London Gazette: (Supplement) no. 53537. p. 20689. 31 December 1993. Retrieved 18 Jun 2011. ↑ The London Gazette: (Supplement) no. 55722. p. 13841. 4 January 2000. Retrieved 18 Jun 2011. ↑ "Battle Proven" (pdf). Flight International. Retrieved 27 January 2013. 1 2 The London Gazette: (Supplement) no. 57315. p. 6. 12 June 2004. Retrieved 18 Jun 2011. ↑ The London Gazette: (Supplement) no. 57521. p. 16360. 4 January 2005. Retrieved 18 Jun 2011. ↑ "RAF Air Rank Appointments List 07/06 of 21 August 2006". Royal Air Force. www.RAF.mod.uk. Retrieved 27 January 2013. ↑ The London Gazette: (Supplement) no. 58245. p. 2084. 13 February 2007. Retrieved 18 Jun 2011. ↑ "RAF Air Rank Appointments List 01/08 of 4 January 2008". Royal Air Force. www.RAF.mod.uk. Retrieved 27 January 2013. ↑ "RAF Air Rank Appointments List 04/10 of 18 June 2010". Royal Air Force. 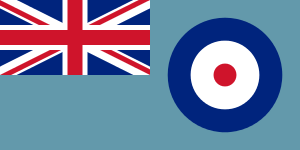 www.RAF.mod.uk. Retrieved 27 January 2013. 1 2 The London Gazette: (Supplement) no. 60367. p. 2. 29 December 2012. Retrieved 27 January 2013. ↑ The London Gazette: (Supplement) no. 60575. p. 14490. 23 July 2013. Retrieved 1 October 2014. ↑ "New senior military officers appointed". Inside Government. 24 January 2013. Retrieved 24 January 2013. ↑ "Senior officials 'high earners' salaries as at 30 September 2015". www.Gov.uk. 17 December 2015. Retrieved 13 March 2016. ↑ The London Gazette: (Supplement) no. 61450. p. N3. 30 December 2015. 1 2 "Joint investiture highlights strength of Royal Navy and Royal Air Force partnership". Royal Navy. www.RoyalNavy.mod.uk. 13 April 2016. Retrieved 14 April 2016. Wikimedia Commons has media related to Andrew D. Pulford.